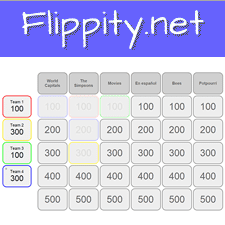 Flippity is a little tool that does big things. In just a few steps teachers can take information from a Google Spreadsheet and convert it into a set of flashcards, a quiz show, or an online quiz with a certificate. A Flippity account is not required (nor is it an option), however creators must have access to Google Apps. Viewers can access the final product through a direct link or QR code, beyond a browser nothing else is needed. Since no data is collected by the developer, students are able to be the creators as well as users of these study tools. This generates digital flashcards, similar to Quizlet. While there are differences in features, a big standout is the ability to add images and videos as card content. Make a copy of the template (different template for each presentation type, available through the Flippity.net). Replace the sample content with your own. Include images or videos by inserting a direct link to the content (unique address for an image or YouTube URL). Further format slides by using simple HTML (bold, italics, underline, super/subscript, etc.) It is also possible to further customize cards by selecting card or text colors. Share: direct link, QR code, card data as a list, Twitter, Google plus, Facebook, Pinterest. Follow the instructions on the website to publish your flashcards. This is my personal favorite... create a Jeopardy style quiz show to increase the excitement in content review or test preparation. Replace the sample content with your own (6 categories, 5 questions each). Include images or videos by following the pattern in the template. Follow the instructions on the website to publish your quiz show. Playing the game opens the board full screen, making it just right for interactive board use. Add or deduct points for up to 6 teams for each question. It is also possible to play without any teams. This is an interesting way to check student understanding and give them a "certificate" to prove it. Replace the sample content with your own (multiple choice). Enter your information into the Options tab, which will allow you to receive notification of each certificate. Follow the instructions on the website to publish your quiz.